As the name suggest, the supplied Air respirator unit, supplies clean air to the wearer. The air is filtered after being supplied from a compressor. Hoods, helmets, full face pieces and loose-fitting face pieces can be worn to which this clean air can be supplied. 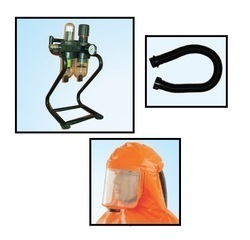 The supplied Air Respirator Unit increases comfort. Productivity and protection while offering many advantages over other respiratory protection systems like cooling or heating incoming air. Looking for Airlines Respiratory Systems ?